Remember, you need to be logged in to see posted attachments! We've added a new "image locator" feature to PictureSnapApp which we think is pretty cool. One can click an image in the image list to display it (or check the display all checkbox to display all the images). And one can double-click the image in the list to move the instrument stage to the center of the displayed image. I should also point out that when one moves these PSA images to another instrument, the stage units and orientations are automatically converted (the files are appropriately renamed), and after one recalibrates the main image, all annotations and (sub) images are automatically calibrated to the new instrument stage. The idea being that by using PictureSnapApp one can easily move one's folder of images to another instrument, re-calibrate the main image and be navigating your sample on the new instrument in minutes. I realized last night that I had forgotten to save the current screen DPI for modified sub images in their corresponding ACQ files, so that is now fixed. This only matters if one moves a set of images from one computer to another and they have different DPI values for the screens. If you downloaded or updated PictureSnapApp in the last few days, please update again. Sorry and thanks. I also wanted to show what happens when one moves their PictureSnapApp image files from one instrument to another. Once the images are on the new instrument, we simply re-calibrate the two (or three) calibration points using the SEM imaging/stage system and we can now accurately navigate to the areas of interest previously located on the EPMA (or visa versa!). I had an idea......... having links to other more detailed images e.g. 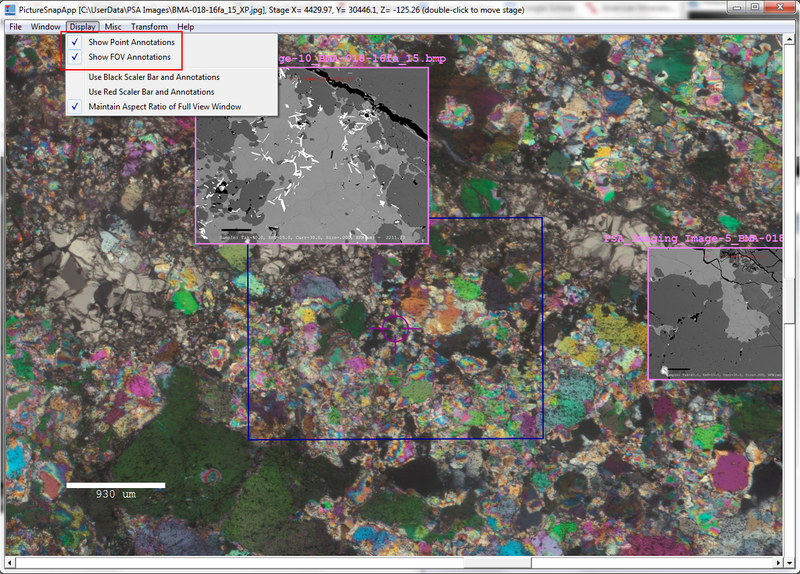 I'm using the SEM to locate some areas of interest in a sample. I'm using a calibrated image in PictureSnap to navigate to the areas of interest and annotate them. I take an SEM image and store it in the same folder as the calibrated PictureSnapApp navigation image. If I click on the link the detailed image is opened for viewing. ** you could, for example, search the folder for images with same file name as annotations in the Annotations Table - Although perhaps 'basic' at least this method would be generic and allow for image link positions to move if the underlying PictureSnap Navigation image is recalibrated. just a thought I had. There are two advantages I see 1)Picturesnap acts like a lab notebook - after your session you can brows your samples and see the context of the images at multiple scales. 2)when moving between instruments, the ability to pull-up the detailled images would help in relocating the same domain area of interest. The more I think about this App, the more I think about how it could be a platform for collating images/measurements from different techniques and different length-scales. Perhaps my mind starts to run away beyond the scope, but I've been imagineering such a piece of software for a long time. GIS meets microanalysis! Pretty much what we implemented I think. Indeed "GIS meets microanalysis! ", but maybe more like "planetary GIS" since each instrument "world" has its own stage coordinate system. A small tweak to help the user. We simply changed the Add Image and Select Remote Image and Save buttons to a yellow background since we suspect these will be the buttons most users will be accessing. Also I didn't show it below, but if one hovers their mouse cursor over these buttons, the "tool tip" help text will pop up and provide a more detailed explanation for each button. Please try this feature out, even just in demo and text input modes. It works great! For those of you with hardware enabled versions of PictureSnapApp, please feel free to post some examples also. Thanks. One of our grad students Marisa Acosta was using PictureSnapApp yesterday to find areas of interest using our CL system in a thin section on our FEI Quanta SEM. Next week she will move these images (all saved in a single folder) to the EPMA computer and open them in PictureSnap to relocate them for trace element analysis. Anyway after she left for the day, I captured a few CL images myself on her calibrated image (the sample was still in the instrument) using the new Select Remote Image and Save button in latest version of PictureSnapApp. In the screen shot below you can see I kept the FEI data bar in the bottom of the CL images. In this mode one simply acquires an image using the FEI software (the default is TIF, but one can also save it as a JPG image), and then (without changing the current stage position or FOV), one simply browses to the saved image and the software automatically copies the image to the local folder, generates an .ACQ calibration file and then loads it into the Image Locator window. To facilitate browsing to the image files on the FEI "Support" computer, I added a link from the Thermo PC that PictureSnapApp runs on, to the SharaData folder on the FEI "Support" computer that we store our images in, using the Add Network Location icon from Windows Explorer. Note, you may need to have file sharing turned on to do this. The last few days when I was working with students on our FEI Quanta SEM using the Image Locator Feature and we noticed that the images displayed on the main base image would sometimes repaint once a second, or sometimes after several seconds, and sometimes not at all. Now the PictureSnapApp software is designed so that if it detects that the stage position has changed, it redraws the current position, FOV and also the scale bar if the FOV (magnification) has changed. But we do not see the same thing on the Cameca SX100. So I thought to myself it has to be a little bit of stage "jitter" because the Cameca returns the stage position to the nearest micron (as an integer), while the FEI returns a floating point value (in meters which is converted to millimeters). So that evening Donovan added code to limit the returned stage position from FEI SEM instrument to the nearest micron, thinking OK, that will help that. But the next day the blinking continued, so looking further into it I then noticed that the X position was always returning the same position (when the stage was stopped), but the Y stage position was sometimes, but not always, oscillating between two values about a micron different. Turns out our stage mechanicals need tightening. I'll get our service engineer on it, but think of it as the software checking your stage hardware stability! Last week Anette von der Handt and I were chatting about a feature in Probe for EPMA where one can acquire images of each standard and if they are placed in the StandardPOSData folder, and named with the first 4 digits containing the standard number in the standard database (e.g., 0012_MgO.jpg for the MgO standard number 12). In this case PFE will automatically load that numbered image(s) when that standard number is clicked on in the Digitize window. It was at that point that we both realized that the Image Locator feature in PictureSnapApp, though originally intended for unknown samples, could provide much better documentation of our standard mounts. So yesterday I decided to take advantage of some of these new Image Locator features in PictureSnapApp (which I have running on the Cameca OEM computer), and document one of our standard mounts that gets used a lot by students. The idea being to make it easier for them to be sure they are on the correct standard. Note that the calibration reports an orthogonality of 2.45% which isn't too bad considering that I only utilized the tops of three of the small standard holes, but a funny thing when I first calibrated it, the reported orthogonality was 27% or so, and I thought: no way I could be off that much, but sure enough the software was right and I was wrong! I had thought I was on one standard hole, but actually I was on the one next door to it! That will cause a calibration problem obviously. OK, I must say this is pretty cool. Good example of the flexibility that this software offers. Nice work John and Anette! And it should be mentioned again that all these Image Locator features work just fine in the *non* hardware enabled mode which is free! In the non hardware enabled mode, one does need to enter the stage calibration coordinates via keyboard, rather than simply clicking the Read Stage button to calibrate the image to the instrument stage. And the FOV (field of view) needs to be adjusted using the up/down cursor keys (shift-up/down for fine adjustment), rather then being read by the software automatically as it is adjusted on the instrument. But you can't beat the price! And for $500 for the fully hardware enabled mode, no ones lab budget is going to suffer too much! I was wondering if it would be possible to put a toggle in the software so you could display the Images from Image Locator without the FOV annotations around them? In my case, I've been importing sequences of images to tile them over larger features, but the bounding boxes and image names get in the way of one another when doing so, and it would be nice to be able to export without the FOV overlays (regular overlays would still be welcome, and also can already be toggled separately). PeakSigh doesn't appropriately tile images due to reported FOV mismatches with the real-world stage dimensions when making mosaic maps, but PictureSnapApp tiles things correctly once I figured out the true stage dimensions correlated with the Cameca-reported BSE FOV. Then I wrote command line scripts to jump the appropriate distances, for efficiency - a reported FOV of 2500um is 2100um from edge to edge, at least when tiling in PictureSnapApp, and the edges match without gaps. Good show! I'm going to check with our engineer to see if there's any way to re-calibrate the BSE fov so I can just acquire good maps in PeakSigh but I'm not gonna hold my breath on that one.